Saltillo Mexican tile has been used in homes in Central and South America for hundreds of years. Though not durable enough to withstand harsh winters outside, these tiles are lovely indoors anywhere. The challenges of this type of flooring include installation of Saltillo tile, restoration of Saltillo tile, and maintaining Saltillo tile. But the benefits — rustic beauty, non-toxic materials used to manufacture, and low cost — may outweigh any drawbacks. Related Reading: Check out our article on the best kinds of tile flooring, including reviews and comparisons! Bring the beauty and peace of Mexico to your home with Saltillo floor tiles. When paired with the right décor, Saltillo tile can have a bit of an exotic feel. It also makes for great solar mass for homes using passive solar energy! Natural beauty of the tiles themselves. The non-toxic materials used to manufacture the tiles. The low-cost of the tiles for the high end look. The tiles themselves are extremely fragile. Maintaining and cleaning the tiles is tedious. Saltillo tile is a type of terra-cotta tile made only in northern Mexico. 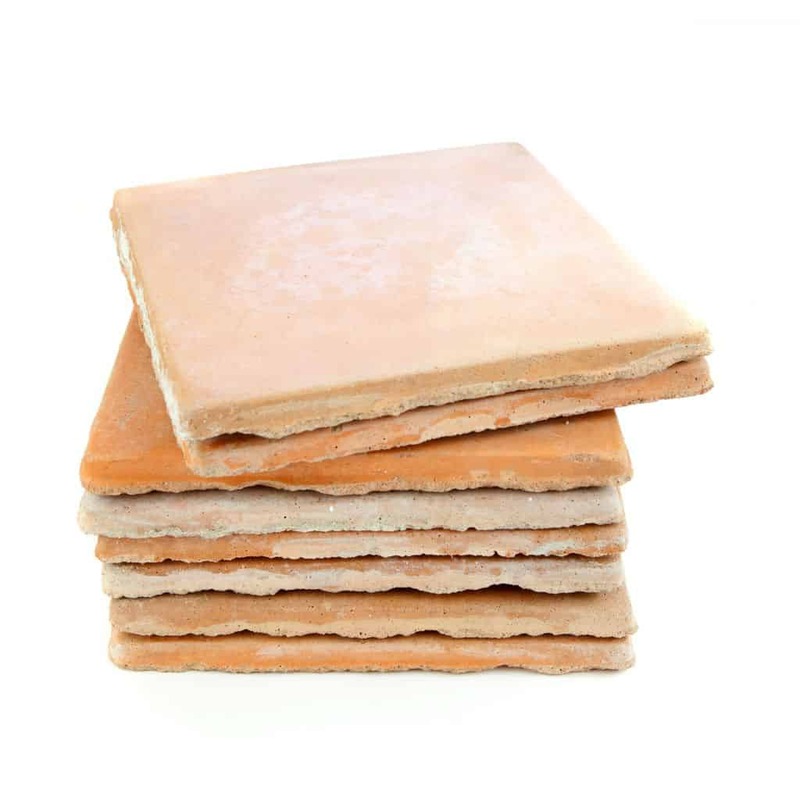 These tiles are made of natural clay that is first shaped by hand and then dried in the sun. Saltillo tiles are then kiln fired to ensure hardness and durability. The tiles are carefully positioned in the kiln in order to create different colors. Depending on the tile position in the kiln, the resulting tiles can range in hue from pale amber to dark terra-cotta. 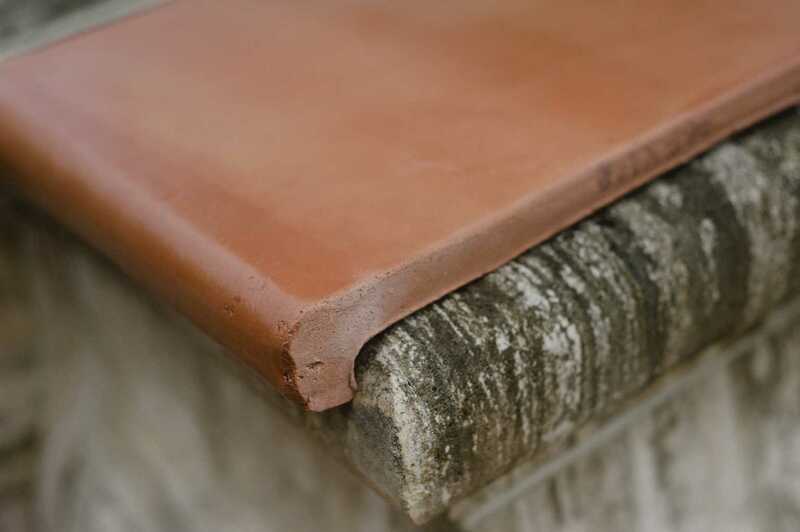 Traditionally, Saltillo tiles are left unglazed, although some manufacturers sell them pre-treated or pre-sealed in order to increase their durability. Naturally, Saltillo tile is not terribly strong or hard. Although it is comparable to other natural stone tiles (such as slate or granite) it can chip and crack. 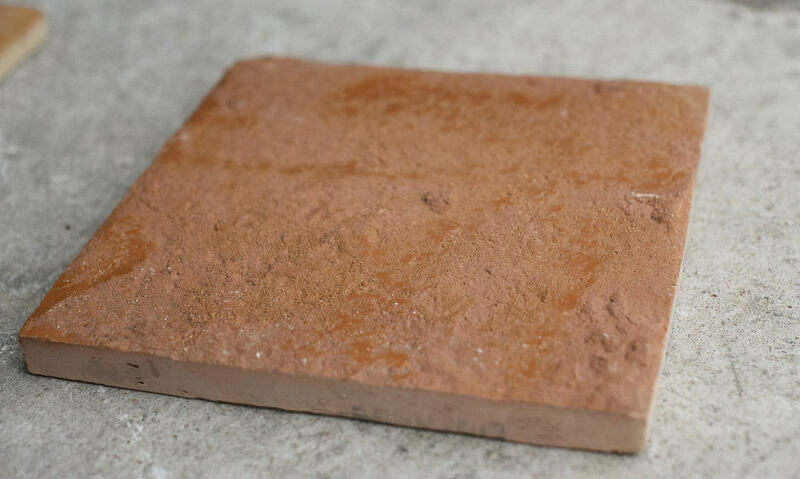 When used as exterior tiling, it can only be used in very mild climates, as harsh weather can damage the tile. Really, Saltillo tile should not even be used indoors in places that are particularly cold, as they will not be able to hold up in the face of colder temperatures. Saltillo tile typically has a MOH (measure of hardness rating) between a 3 and 4, which is fairly low (compare to porcelain, which has an average MOH of 7-9). Therefore, it is very rarely used for outdoor purposes these days, though it very warm climates, well maintained and sealed Saltillo tile makes for a nice tile flooring option for a patio. However, the elegance and beauty Saltillo Tile brings to the interior of the home more than makes up for its lack of strength and hardness. Installing Saltillo tile also has to be done carefully, as the tiles are delicate. Any grout or chemicals spilled on the tiles can damage them, so it is crucial to keep the tiles covered with paper until the installation is complete. This is not typically something that you will want to attempt yourself unless you have a good bit of experience with tile installation and feel confident with your abilities. However, because individual Saltillo tiles are so inexpensive, you can take a little liberty and losing one or two tiles during installation will not obliterate your flooring budget. 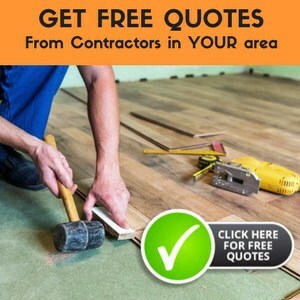 Prior to starting installation, you will need to make sure the subfloor is perfectly prepared. The flooring must be perfectly level and there are no cracks, holes or misalignments where moisture can get trapped. The tiles can be laid starting in one corner of the room or starting from the middle of the room, but the last row of tiles will need to be cut carefully to fit. Once the tiles have all been laid, a sealer will need to be applied, then a grout, and finally at least a second layer of the sealer. As Saltillo tiles are fired at such low temperatures, they remain very porous and are therefore very susceptible to water damage. It is almost exclusively recommended these days that you seal Saltillo tiles to protect them from water, wear, and scratches. Typically, Saltillo tiles should be sealed after they have been installed and are completely dried and clear of extra dirt and debris. You will want to decide primarily how much shine you are wanting from your floors and choose a level of gloss or matte for the sealant and polish appropriately. Sealant should be applied in several coats, and the number of coats can vary depending on the manufacturer’s recommendation. Saltillo tile in the home has a few drawbacks. Regular sweeping is one of the best ways to maintain the Saltillo tiles in your home. While some recommend vacuuming, regular vacuuming could chip the tile, which is why sweeping is really the preferred method for daily maintenance. For a deeper cleaning, unsealed and untreated tile needs to be laboriously cleaned with diluted ammonia and “elbow grease”, and lots of rinsing. Saltillo tile floors need stripping and resealing, before and after cleaning to do a proper job. It is important to also wipe up any spills and dirt right away, as the tiles can stain. If the floor is ever flooded, the delicate tiles will be severely weakened. Only slightly damp mops can be used on the floors, and only the very mildest cleansers (no harsh chemicals). Also, a sealant will have to be reapplied regularly to keep the floor in good condition. 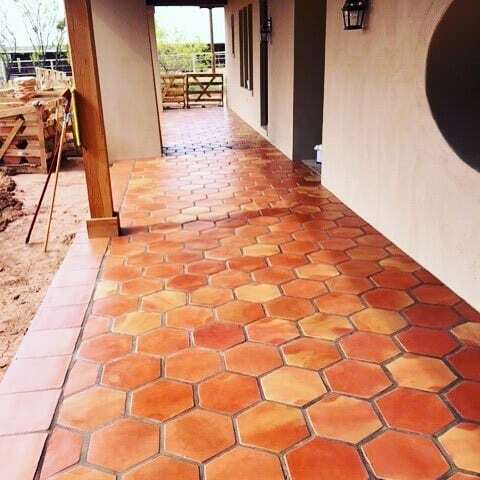 If you are planning to refinish Saltillo tiles, you will need to make sure any previous polish or sealant has been completely stripped and all that remains is the basic Saltillo tiles. To strip the tiles, you should use a gentle solvent and a soft bristle brush to prevent damage to the tiles themselves. Also, when refinishing, a new grout will have to be applied along with the new sealant. Despite these disadvantages, there are many benefits to selecting Saltillo tile for your flooring needs. Primarily, Saltillo Mexican tile is beautiful and offers design flexibility. Whether you have a modern home, a country French-style residence, or love the Mediterranean style, the natural beauty of Saltillo tile can make your home truly stand out. Although this tile requires a little more effort to care for, many homeowners and decorators feel that it is well worth it for the beauty it brings to any room. Modern sealants do make cleaning and caring for Saltillo tile easier than ever before. The tile itself is comparatively inexpensive and many homeowners like the all-natural products that go into the tile-making process. At a time when we are surrounded by chemicals, it is nice to bring a natural product into the home. The greatest benefit to Saltillo tile is that, because it is inexpensive, people feel free to experiment with various patterns and designs with the tiles and the results can be truly unique and spectacular. The tiles are readily available via almost all leading suppliers and, therefore, sourcing the product is not difficult at all. There are even blogs dedicated to various Saltillo designs where you can find inspiration and demonstrations of a whole selection of incredible designs. Perusing these visual examples can give you a clear idea as to how you want your flooring to look. If you need further or more specific advice, your Saltillo tile supplier will be able to recommend a few experts who can help you make your choices. In general, natural tile flooring is a beautiful and durable flooring option for your home. If you’re looking for advice on specific tile flooring options, most popular professional companies, such as Lumber Liquidators, are happy to provide information regarding specific tile flooring options or installation and will even do in-home consultations at no charge. If you want a naturally beautiful and affordable flooring solution, consider installing Saltillo tile in your home. It has been trusted by savvy homeowners for hundreds of years. Is it time for you to trust too? You say that satillo is very design compatable. We just bought a place that has satillo bordering vinyle in the kitchen and grey carpet in the hallway. I think it looks awful! Any suggestions? Decorating is really a personal choice. I would get some samples from a local supplier and try to decide what looks best to you. I moved in to my boyfriend’s house which has Mexican saltillo tiles throughout the downstairs. It is in terrible shape – no amount of “elbow grease” will take out the grime. I have even tried SOS pads in hidden areas. There is ground in dirt, hair from the dog, and other grime imbedded in to the tile. I have called professionals and seem to get a wide range of pricing to clean from $500 – $3000. We don’t have the money to have it done right. Any suggestions on what I can use myself. I am very capable. 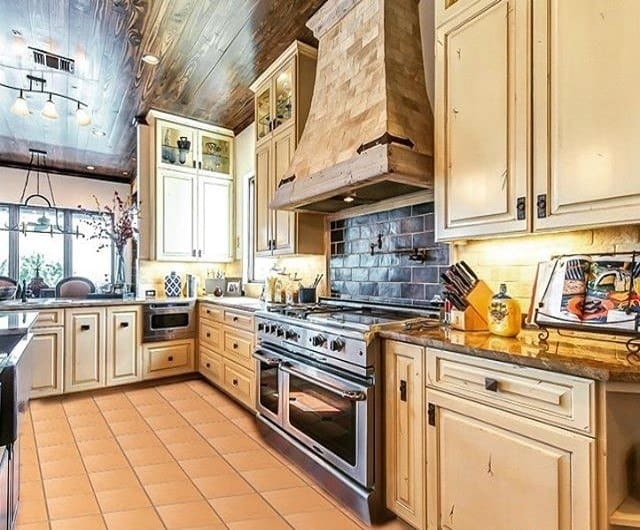 Moved into a house with great saltillo flooring, but there are some sections of grout that have nasty yellow thick wax build-up that will not clean or strip – I’m thinking about taking an abrasive wheel to it – any thoughts on that? Also, had to have a few tiles replaced and a larger section where a built in planter was removed and a new foundation poured (area 4×8′), and within two weeks of the replacement, one tile cracked (hairline from opposite edges across face of tile). The installer came back and said he did not use a flexible tape underlay and after removing the tile noticed that the original foundation was cracked there. He replaced the broken tile, and now a week later a second tile has broken. What do you recommend – should I be arguing with the installer to replace all the new sections and use the correct underlay? A vinegar and water solution of 1:15 parts is a great cleaning solution to try. You can also add some baking soda as a cleanser to scrub with. Once the floor is cleaned, you may want to look into sealing it to help make the cleaner easier. I have saltillo tiles downstairs and would like to add them up my staircase and onto the landing. I have never seen a picture of saltillo tiles on the top and facing of stairs indoors. Is there a problem having them installed on stairs? I would certainly ask the installer why an underlayment was not used to prevent the tiles from tile from cracking. The abrasive wheel on the grout would probably remove the build up, if you have already tried to stip it, then there probably isn’t any sealer left to worry about. However, you may want to seal the grout, the same as your tiles when you are finished. I have 3,000s.f.of saltillo tiles that I have no idea what the previous owners used to clean and seal. I tried a stripper from a tile company and came up with white,sticky,boogers which were a nightmare to scrub off. It also didn’t even touch the stuff that has “pooled” and yellowed in the grout lines. This is a living nightmare. I got an estimate from a tile company, $18,000! Say what!!! So Madame Tile Lady….please let me in on ANY tricks to get this gluey stuff off my floors. That does sound like a nice idea. I would suggest that you speak to a professional installer and ask them about it. There may be no reason at all why they could not be installed on the stairs, other than difficulty in laying them there. Though I would think it would be very hard (if not impossible) to get the ones on the facing to remain in place while drying. The “white, sticky, boogers” were probably the old sealer coming off the tile. I would suggest trying the stripper a second time, and see if more begins to come off. It possible that the flooring has had multiple applications of sealer, and it is going to take a while to get it all removed. Another suggestion would be to contact a manufacturer of the tiles, and ask for their suggestions. Could you please help me. I have a Mexican tile floor throughout my house. Can you tell me how to clean it good ( grout included? I want re sealed it. Also I have some holes in the tiles that need to be filled. Any suggestions? Also any suggestions on touch up paints? Could you please tell me how to strip my floors before resealing them again? Is there a quick way? Thank you so much for this site! I’m at my wit’s end now trying to decide what to do next. A tile cleaning company cleaned and resealed our two-year-old Saltillo tiles in the kitchen with the Miracle 511 Impregnator Sealer, which is water-based and not recommended for Saltillo tiles, per the manufacturer. Miracle’s technicians told us that they should have used the oil-based 511 Porous Plus, which they specifically developed for Saltillo tiles. Is it okay for the tile cleaning company to use 511 Porous Plus on top of the impregnator or do they have to strip the floor again? Also, we had told them that we wanted a semi-gloss finish and it was part of the quote. But they just went ahead and used an impregnator sealer that doesn’t give the floor any sheen whatsoever. Then they scared us from using any topical finish because of the upkeep. They said we would have to have the floor resealed every 3 months. Problem is, we would really love for it to have a bit of sheen. Is there something we can use that is similar to Mop & Glo that doesn’t create a build up of waxy residue? Please advise. Thanks so much in advance. Hello, I used to be a coating’s chemist and because my home was severely damaged by tree during a storm, I opted to use Saltillo tile through my entire home, including the stairway. Due to, what I consider, this flooring to be extremely expensive, I’ve decided to not use the standard water or oil based sealer but instead, make a solvent based 2 component epoxy to permanently seal my floor. Through my research and in dealing with Saltillo suppliers, I’ve learned that this has never been done or possibly has and not divulged for public knowledge. I tested 4 epoxy resins on clean Saltillo and interestingly, only 2 adhered strongly, in fact, this coating will never come off unless someone wants to use a paint stripper or tear up the entire floor. I’m curious why this is not an option for those that would prefer a life long, easy to maintain, stain resistant, sealant? Of course, there is a draw back and that is chalking in areas constantly exposed to sun light however, being that this will be for interior installed and used Saltillo, direct exposure would be minimal.